604 Washburn Ave, Louisville, KY 40222 is a beautiful three bedroom 2 1/2 bath home in the heart of desirable Lyndon! The Great Room with neutral walls & a gas fireplace welcomes guests. New owners will appreciate the Eat in Kitchen with newer stainless appliances (two to three years) and white cabinetry. The first level also includes a Half Bath. Upstairs you'll find a good sized Master Bedroom with Master Bath & walk in closet. There are also two additional Bedrooms on the second floor along with a Full Bath. 604 Washburn Ave, Louisville, KY 40222 showcases a large back yard surrounded by full wood privacy fence. The sunlit patio & mature trees make the back yard perfect for outdoor dining & entertaining. The home also backs up to Warwick Park. There is a two car attached garage as well. Updates include carpeting in the upstairs Hallway & Master Bedroom, flooring in the upstairs Full Bath, & new flooring downstairs. Call our team at 502-371-1173 for more information about this home! 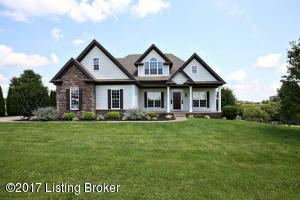 Join At Home In Louisville Real Estate Group this Sunday August 13th from 2-4 at our new listing in the heart of Lyndon! You'll love this move in ready 3 Bedroom 2 1/2 Bath home with 2 car attached garage. Call 502-371-1173 for more information about this beautiful home for sale in Louisville! Join At Home In Louisville Real Estate Group this Sunday August 6th at our brand new listing in the Fisherville, KY Gorgeous 3 Bed 3 Full Bath in Fox Lair! Call 502-371-1173 for more information about this beautiful home or visit with us this Sunday from 2-4 at the Open House!